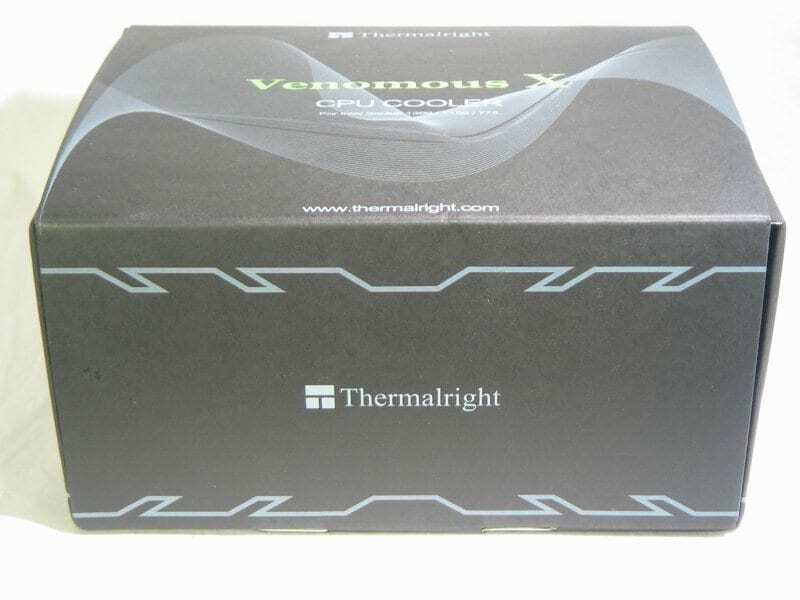 Thermalright aims to up their game with the recently released Venomous X, which we’re going to have a look at today. 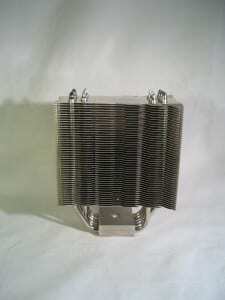 Mirrored copper base improves the performance of the heatsink. Special bent winglet design allows hot air to pass through the heatsink more rapidly. Nickel plating designed to ensure long-term quality and performance. 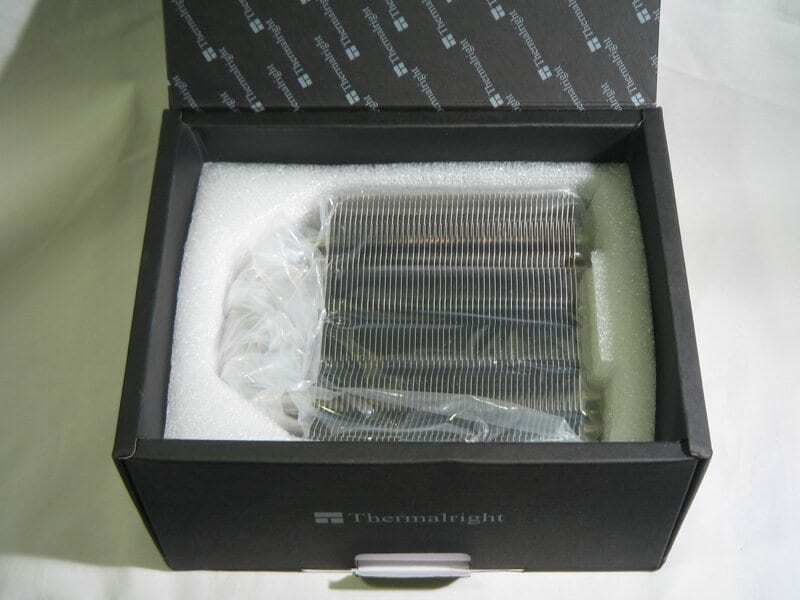 Six sintered heatpipe design. All heatpipes are nickel plated to slow oxidation of the heatpipe; this ensures a longer lifetime and higher performance of the heatsink. 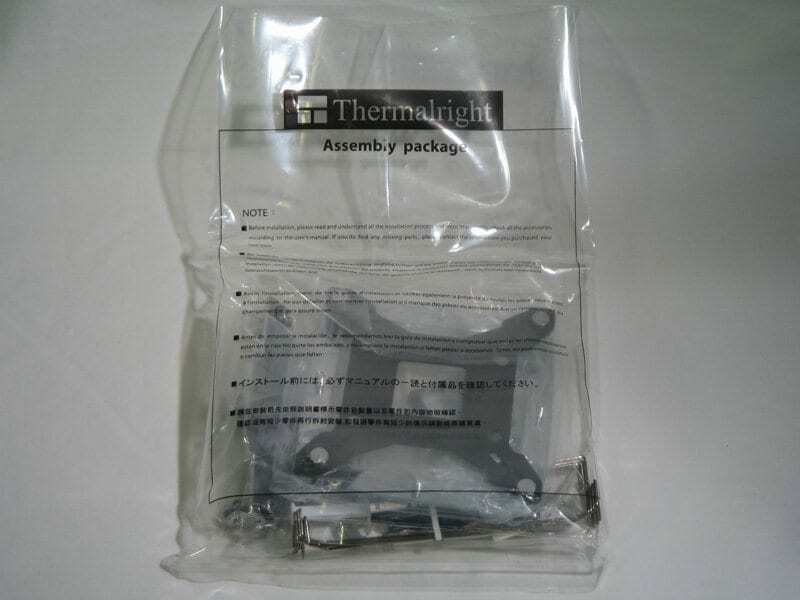 Includes 2 sets of 120 x 25mm fan clips and Chill factor II thermal paste. 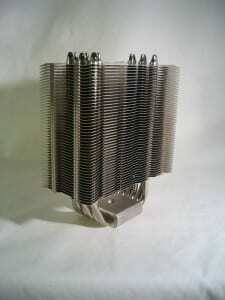 Convex copper base design to improve contact between the cpu and the heatsink. So far it looks like a very strong contender. Let’s see how it looks! The cooler comes in an elegant, if understated package. 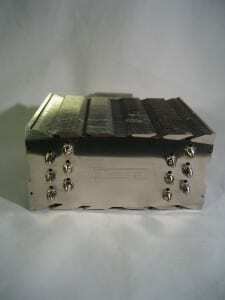 The box of accessories and the cooler are encased nicely in foam inside a matte black cardboard box emblazoned with a metallic green Venomous X label. The accessories pack contains all of the essential if you use a current-generation Intel CPU. However, if you want to use it on an AMD CPU you’ll have to buy an additional bracket. 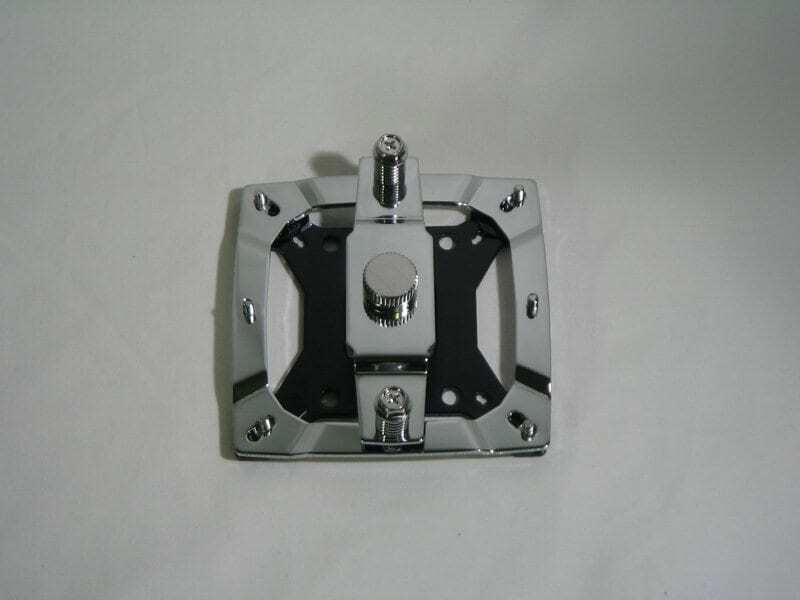 If you use an Intel CPU from any recent socket – be it 775, 1156 or 1366 – you have a very strong, user-friendly mounting bracket. In addition to the bracket you get two sets of fan clips (rated to work on 25mm thick fans but they work fine on 38mm thick fans). The mounting mechanism is quite intuitive. 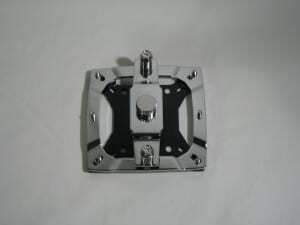 First you set the back plate to the proper socket. This is easily accomplished with simply clicking the mounting screw in the right place. 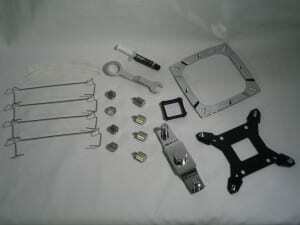 Once the plate is behind the motherboard, you secure it with the first set of thumb screws. Place the bracket on these and secure it with the second set. Then you’ll mount the cooler (not pictured) and use the crossbar to secure it in place. Once mounted you can use the supplied wrench to tighten the torque to your liking. For all tests in this review, the torque screw was cranked down as far as it would go. Once mounted, it’s definitely not going anywhere. The cooler feels very secure and thermal paste was consistently spread evenly across the chip every time the cooler was mounted. This isn’t the largest cooler on the market, but it is still quite sizable. Measuring 127mm long x 63mm wide x 160mm tall, it’s quite an impressive sight. Add to that the fact that the heatsink itself (not including fan brackets, fans or the mounting system) weighs 755g – that’s one and two-thirds pounds – and you have one beastly cooling machine. As hardware goes, it’s quite nice to look at. 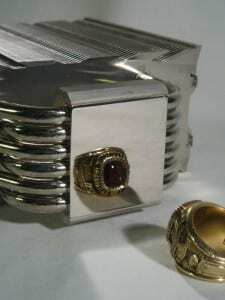 The finish is impeccable and would complement anyone’s hardware well. The six 6 millimeter heatpipes are staggered so that they’re not in a straight line when mounted in the fins, presumably to help cooling by getting airflow on the actual heatpipes and not just on the fins they’re attached to. In the photo on the left, if you look at the top of the base you can see the hole where the torque screw applies its pressure. It’s nice they did this in addition to making the bracket bend over the base. It makes mounting it in the right place that much easier. The base is lovely to behold. 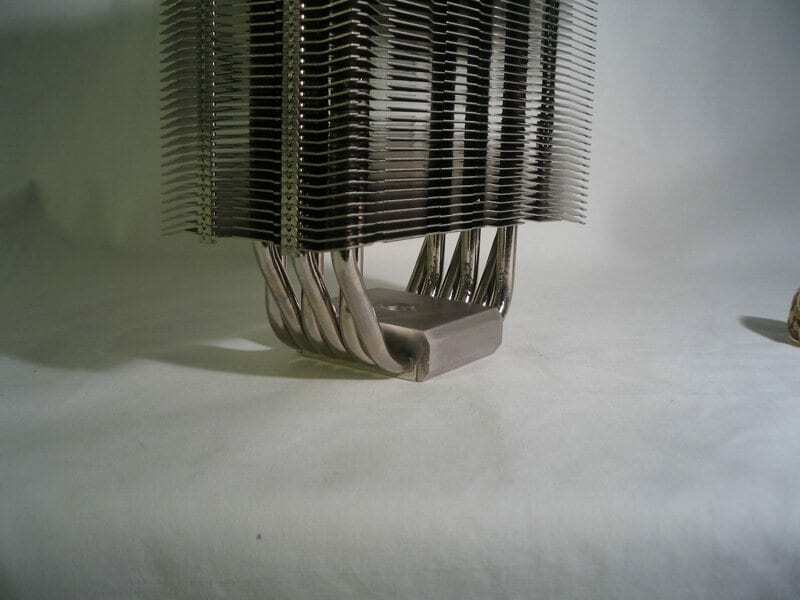 Smooth and shiny thanks to the nickel plating, it is a very nice way to end our tour of the bare heatsink. Installing fans with the supplied clips is a breeze. There are holes in the fins to put the end of the clips in. Place your fan in the (very convenient) grooves that hold it in place horizontally and pull them over. There are photos both with one and two 38mm thick fans attached. With two 38mm thick fans, this thing goes from formidable to insanely large: unfortunately too large. In a sad turn of events, the only decent fans available for testing at the time were 38mm thick. While this is almost always a good thing, in this case it was a detriment. 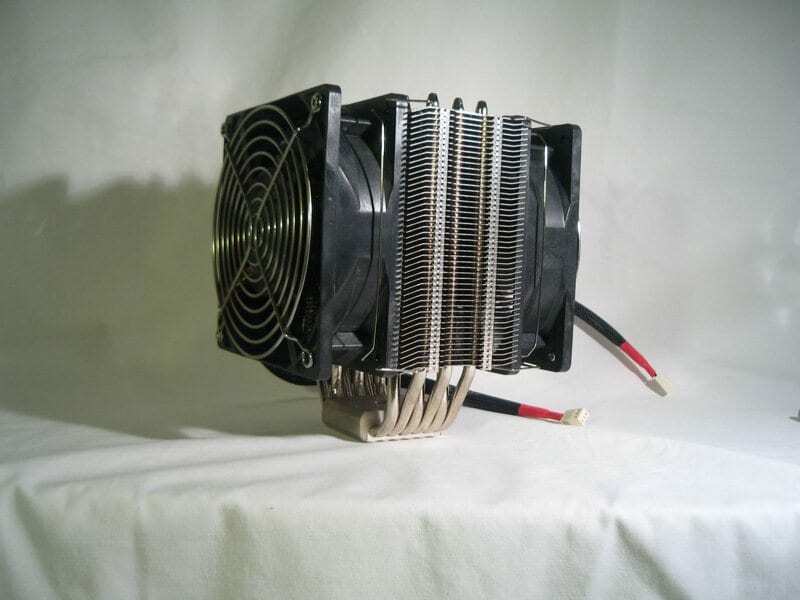 The 38mm ‘push’ fan did not fit over my system’s rather tall RAM (G.Skill Trident series) heatsinks. Sadly, this means the only testing that could be done was with one (very powerful) fan in pull. For reference, below are the width measurements with both types of fan in one- and two-fan configurations. Note this chart does not include measurements for grilles. 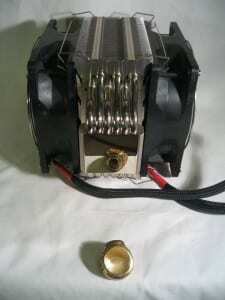 Fortunately, the fan in question is an Ultra High Speed Panaflo, model # FBA12G12U1BX. 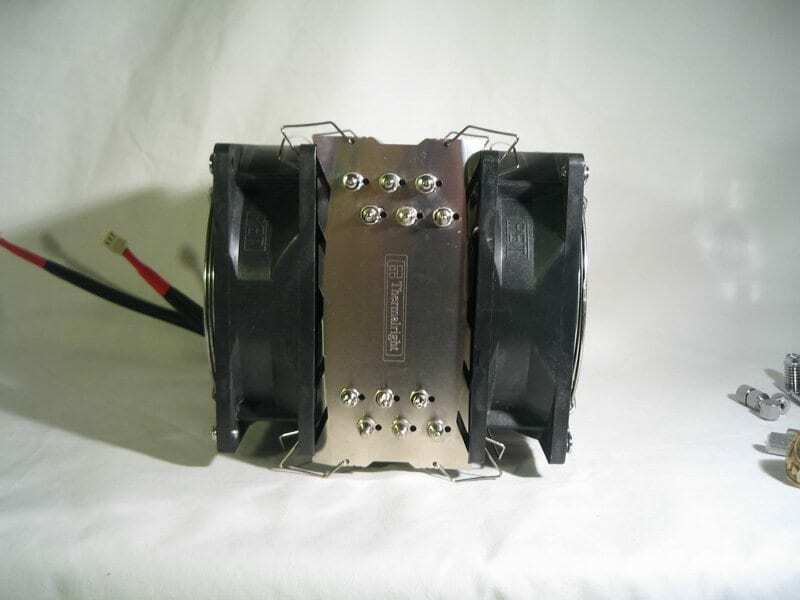 This is a very powerful 120mm x 38mm fan, running at 2750RPM and moving 114CFM of air. Even one should be more than sufficient to gauge this heatsink’s performance. Unfortunately, due to logistical concerns, I was unable to photograph the installed cooler – I will be doing follow up testing (on a different CPU, testing push/pull/push-pull stuff with 25mm fans) and will post a photo when that happens. The CPU being cooled for this review is an Intel i7 860 – a furnace of a CPU. 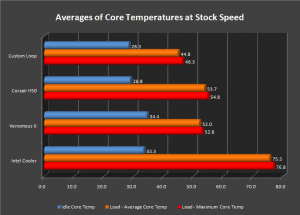 If you really want to test a cooler, an i7 is the way to do it. 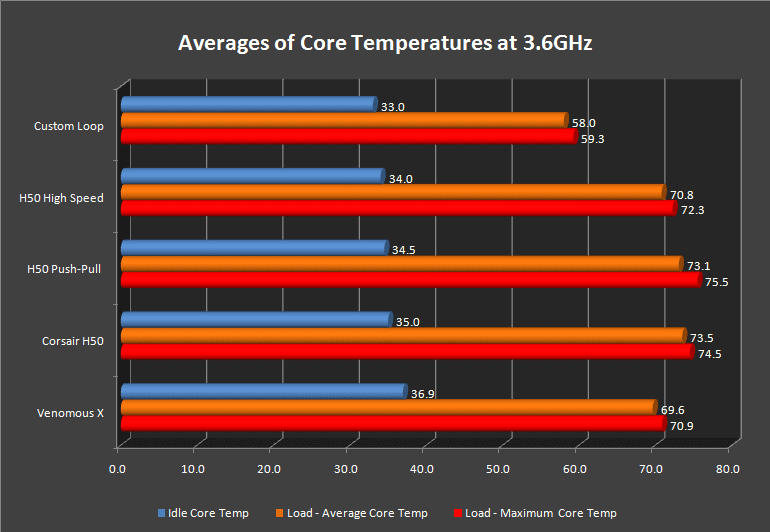 Tests were run at three speeds: stock, a moderate overclock (3.6GHz) and finally at 3.8GHz. The machine in question runs stable at 3.8 GHz 24/7. The Venomous X is being compared in this review to results obtained in the previous review of the Corsair H50 on this same system. You may recall that I said the H50 was “Quieter than air cooling with equal or slightly better temperatures.” Time to put my money where my mouth is and see if that assumption was correct. Swiftech MCP-355 pump with XSPC reservoir top. 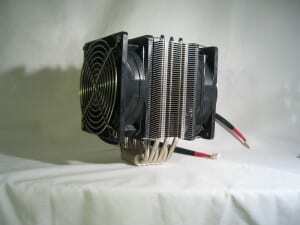 Swiftech MCR-320 radiator, mounted externally with three Ultra High Speed Panaflo fans running at 7V (+/-.1V) for all tests. Swiftech Apogee XT water block. All linked with Primchill Pro LRT 7/16″ inner diameter tubing. Of course, bear in mind when viewing the results that the water loop is way (way) more expensive than anything else compared here, coming in at $270 – and that’s not including tubing and barbs. The H50, however, is at a very similar price point (~$65) to the Venomous X once you include some quality fans. 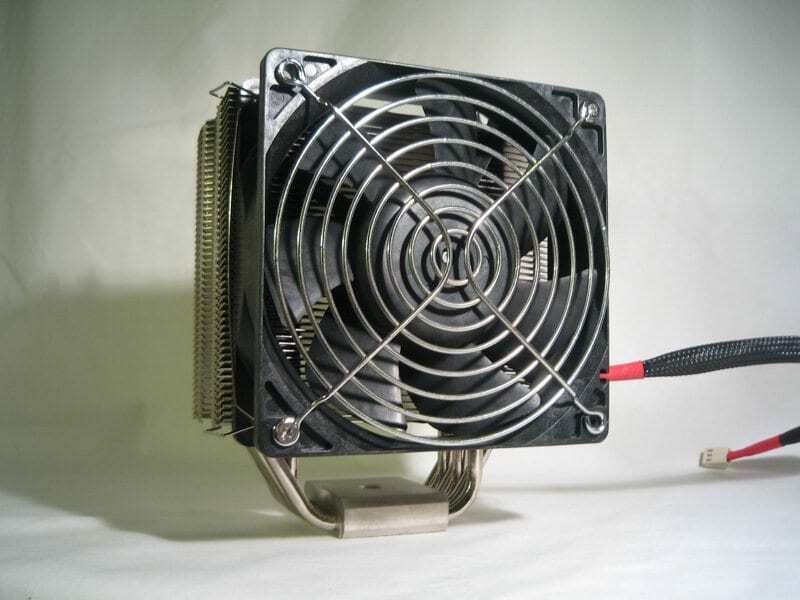 The Prime95 Small FFT test was the punishment of choice to stress the CPU for obtaining load temperatures and was run for a minimum of thirty minutes. CPU temperatures were measured using Coretemp’s logging function and ambient was measured with a common room thermometer to the nearest 0.5ºC. 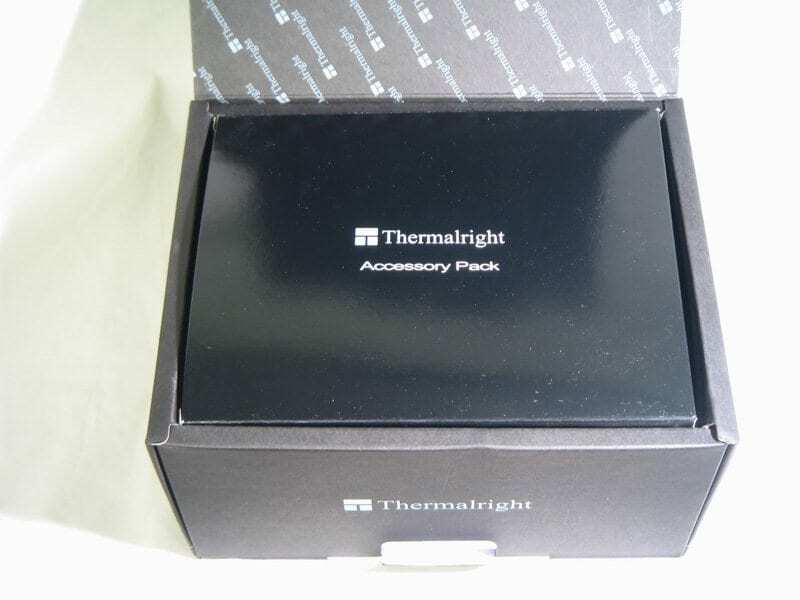 The thermal interface material used was the included Thermalright Chill Factor II. Since this did not come pre-installed (which is a good thing), the cooler was mounted three times and temperatures reported below are the average of all three runs. The difference between runs was minimal. The mounting system included with this cooler is excellent, providing uniform TIM contact very consistently. 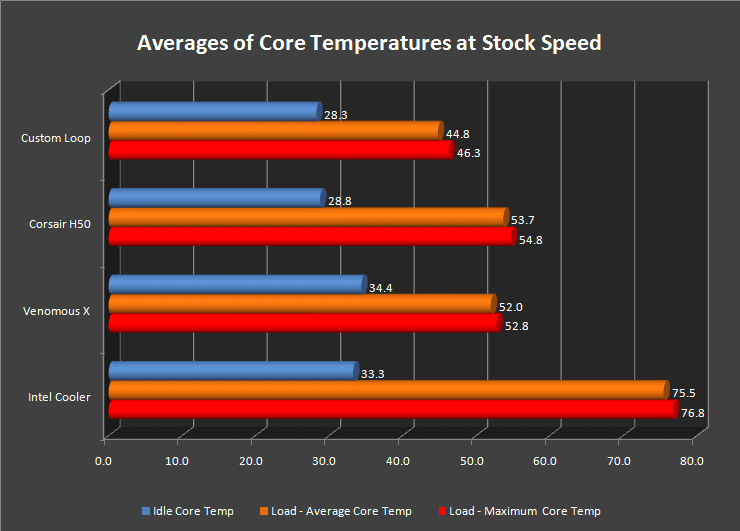 The first five minutes of the temperature results were discarded (to allow the cooler time to warm up) and the remaining results were averaged, over the subsequent time, for each core. 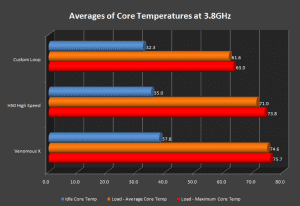 Presented in the graphs are the average of all four cores at idle, the average load temperature of all four cores and the average maximum temperature of all four cores. All data were obtained from averaging the three runs together. Rather than present you with a deluge of data and screenshots, below are some graphs to make it easier to digest. All temperature results were normalized to 22ºC ambient (per the esteemed Vapor, “…ambient and core temps scale perfectly fine (1:1) with i7.”) Of course, for anyone that likes to pour through screenshots and excel spreadsheets, the test data can be downloaded in its entirety right here (it’s about 6.5MB). For comments on how temperatures were measured on the competition, please refer to the H50 review testing methodology. Now, without further ado, let’s see how the Venomous X performs! We’ll start off with stock testing. Predictably, the stock cooler is woefully inadequate to deal with the heat output of the CPU it was bundled with. The custom loop is, of course, the best (a trend repeated across all of the results, so this is the last you’ll hear of it). What is somewhat surprising here is that the Venomous X is actually outperforming the H50 under load! Moving on, let’s have a look at how it copes with a decent overclock. The i7’s are hot to start with, but once you kick them into higher gear by overclocking a few hundred MHz, they really put out some heat. The Venomous X still out-performs the H50 – even when you replace its fan with a much stronger high speed Yate Loon fan. It is important to note that the high speed fan on the H50 is a fair bit quieter than the one on the Venomous X – going back to my point in the H5O review: The H5O will perform about equally well as a good air cooler, but will be a bit quieter. Let’s see what happens when you throw a couple hundred more MHz into the mix. The Venomous X finally falters, but by only a little. It’s still performing just about equal to an entry level water cooling option, which is not bad at all! 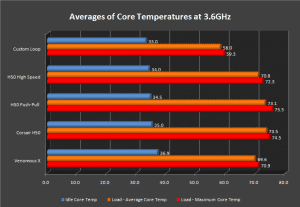 Temperatures are still in the acceptable range and those that are willing to push the envelope a little more could probably squeeze out a greater overclock with decent results. What is there to say that the numbers didn’t already prove? 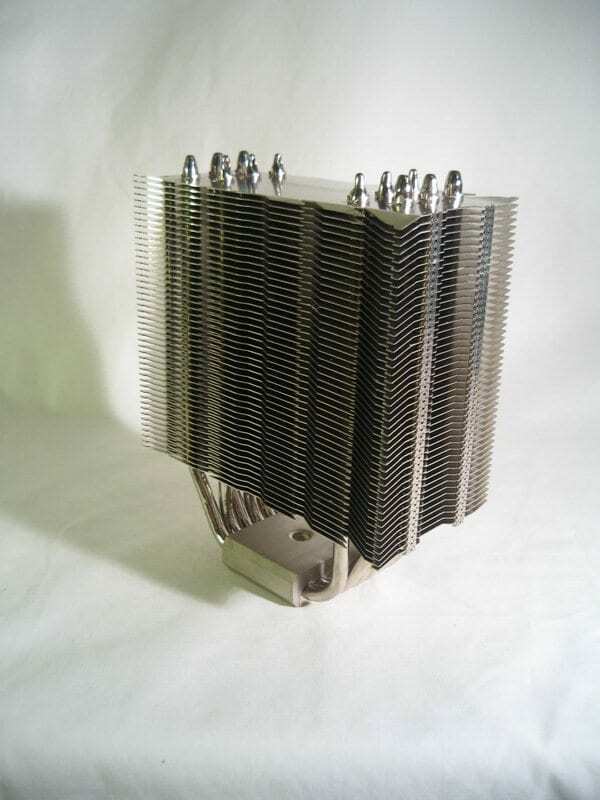 This is most definitely a very good heatsink, holding its own even versus a very popular entry-level water cooling unit. Size could be a factor in some situations. Hardly a con if you pay attention and measure your space first though. The Venomous X is available for roughly $65 ($63.99 at CrazyPC, $62.95 at Sidewinder, $69.95 at Jab-Tech). Don’t forget however, to get performance like this out of it you’ll need a powerful fan or two. These can run $15-$20 each, depending on the model and manufacturer you go with. 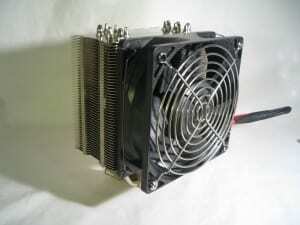 If you’re looking for one of the best heatsinks on the market, this should be at or near the top of your list. 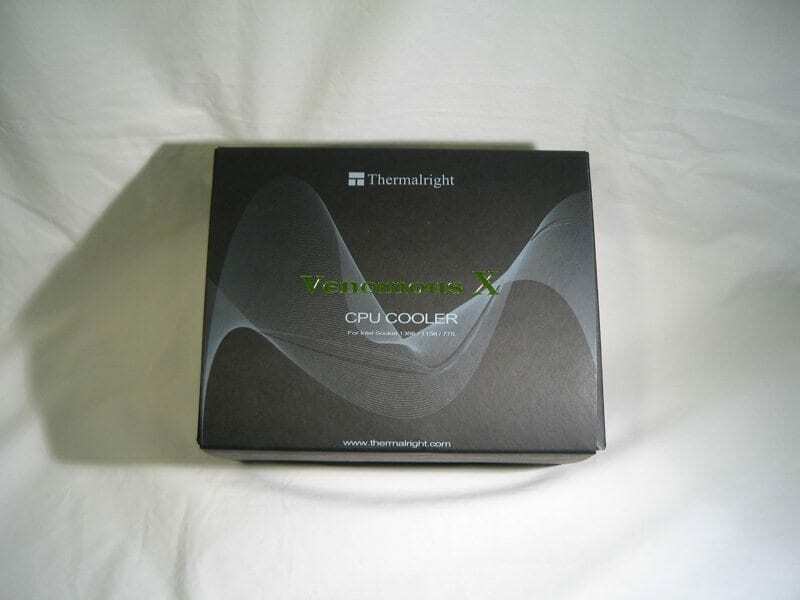 From its great looks to its superb performance, Thermalright has gotten it right (heh) with the Venomous X! 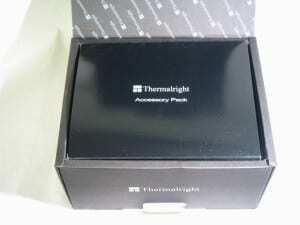 Thanks very much to Thermalright for supplying this unit for review. Lol, I just finished up my article on the VX yesterday, just waiting on baditude_df's input on his section. 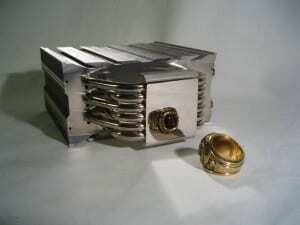 Our articles should complement each other, since I didn't have any other high-end cooling to test the VX against. Sounds good...now I'm looking forward to see how they go together! Why not compare to the H50 with identical fans? 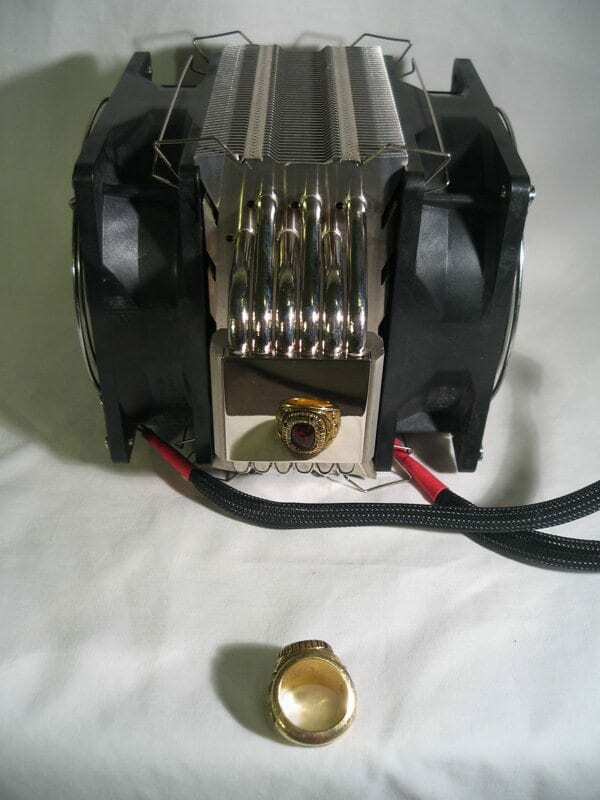 I had no screws to put a 38mm fan on the H50 at the time of its review (which was quite a while before this one). I do have some powerful 25mm fans now and will be running a comparison on both as soon as I have time. There are other new products that have to be reviewed in the mean time, but I'll get more testing done when I have time, rest assured! A couple of points, hokie. 2. 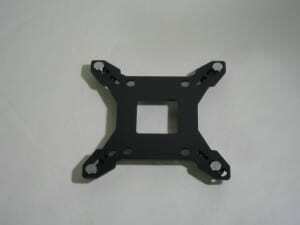 Did you try screwing the center tension screw down all the way, then mounting the crossbar to the mounting base? If not, give that a whirl. I found that I got more consistent and generally better mounts with my Ven-X by mounting that way. 1. Honestly - because I didn't think of it. Also because I ordered a bunch of 25mm screamers and knew I would re-test it. Will do a follow up article after my current review pile is reduced a little bit comparing push- to pull- to push-pull. I'll do that with the Venomous and the H50 if I'm able. 2. That's precisely how I mounted it in the subsequent mounts. The first was done by mounting the crossbar and then tightening the tension screw. The other two I made sure it was tight first. Honestly, it's such a good mounting system, the TIM patterns were about as close to identical as you can get with all three mounts. It's a great system really, very impressive. I just want to say, nice article. For my Venomous X I dropped a 2 very small washers (that fit into the hole on the HSF) to take up about 2-3mm of additional screw down on the HSF and this added way more tension. 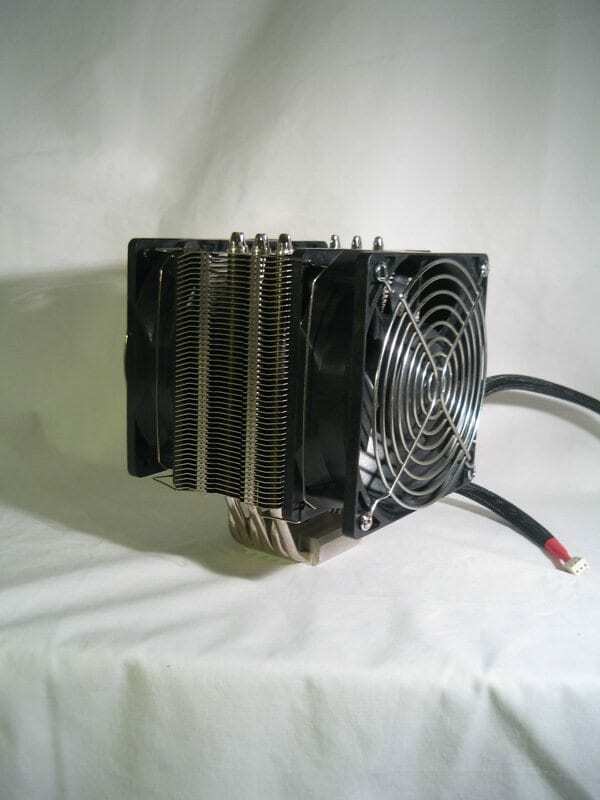 This keeps the Heatsink from being able to be twisted with relative ease. It also lowered my temperatures immensely. Its the equivalent to the washer trick done on the TRUE. I believe they were 3mm washers. Thanks for this, I've got some 3mm washers handy and I'll definitely try this out. What kind of temperature drops count as immense? Thanks for posting that hint up, Brutal. :thup: I guess I'll have to give it a try also. I dropped another 4 degrees when I did this. I prime now at 81 degrees. I think results may vary though depending on how well your VX sits. Mine I could turn very easily, so I went to work and dug up some washers to drop down in the hole. Now I have 4mm left that I can turn the knob. Before I did this, the Screw was bottoming out. on the screw down bracket. There was two ways to do this, I could either file down the screw bracket, so I could turn down further (I didn't like this idea, because it would require very accurate filing/sanding and possibly mess up the threads) or drop something in the hole to take up the some of the slack. Basically you can't fill the hole all the way to the top, otherwise, the tip of the centering screw can slide off the HS. But you really only need about 1-2mm to drop down into. The Thumb Knob bottoms out on the Bridge.